Supanova is upon us once again. The really dedicated geeks amongst us descended upon Claremont Showgrounds in the cold for Preview Night. It's a chance to see some of the guests a little early at the official opening, see a couple special panels and get a head start on autograph tokens. For me it was a chance to get some time with a living legend of the comics world. 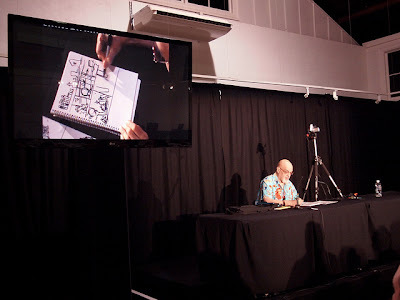 George Perez hosted an intimate little seminar, his comics masterclass. 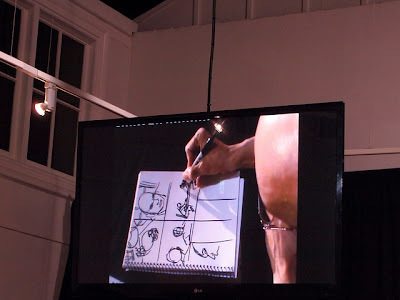 It was an opportunity to watch him explain his craft both verbally and physically as he sketched some rough pages live in front of the audience. So what did I learn from the old master tonight? Hit the jump and find out! After battling traffic and grabbing our passes we frantically through the showgrounds looking for the seminar area. Supanova has grown exponentially since last year with much more space in multiple halls. Great to see the event getting bigger and bigger. 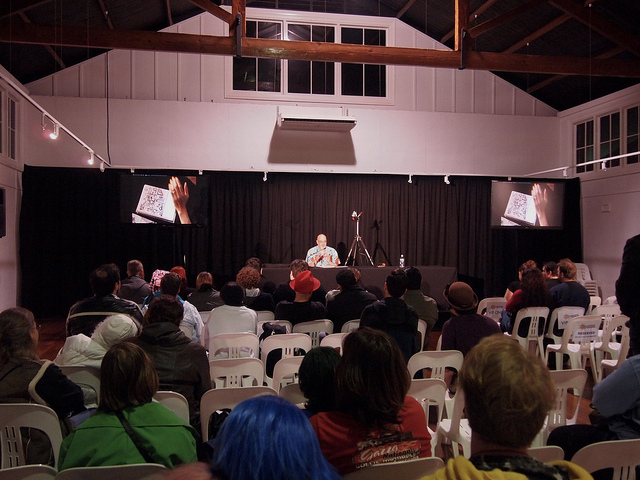 We wandered past a long queue for an exclusive Knights of Merlin panel and checked out the main stage. The opening was on with some of the guests talking briefly and hyping the weekend. Tom Taylor was on stage when we got there. I'll be seeing more of him tomorrow. We finally found the seminar room and rushed in excitedly. Inside was 20-30 dedicated comics fans. Up the front informally chatting with everyone was the one and only George Perez. One look at the man and you can see what a character he is. Truly larger than life wearing his trademark, loud Hawaiian shirt. This one, made by his wife he tells us, was covered in dragons and knights. He's an excited, animated man and a true joy to talk to. It was showtime so we all found our seats. George hopped up to the table at the front and took his seat. 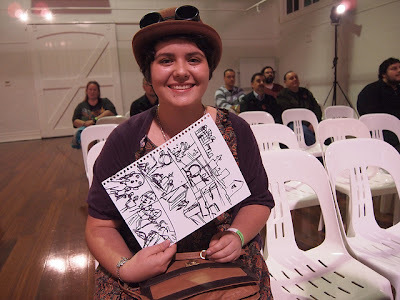 A camera was fixed over his shoulder with a clear shot of his sketch pad. We realised we were going to see the man do his craft right in front of our eyes. After some introductions and applause George explained what he believes the role of a comic book artist is. Not just simply a penciler and inker, George sees himself as a storyteller. 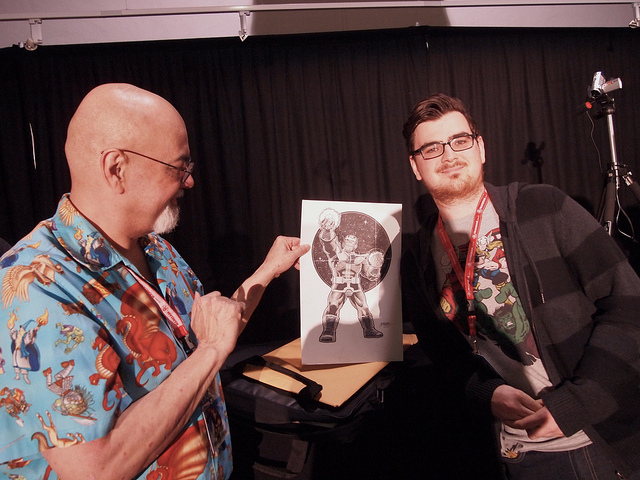 He's in charge of costumes, camera angles, set design and making sure things stay consistant from panel to panel. This is a unique role only found in the world of comics. Ideally, a good artist like himself will lessen the work of the writer. The writer has precious little space in those little word bubbles. If George has done his job right, the writer needn't waste space explaining things like what's happening and the setting, he can use his words on characterisation, story and interplay. With the floor open for questions a gent asked George on the differences in working as a writer/artist instead of solely being on art chores. George explained that he sees comics as a true collaborative pursuit between the creative time. When tasked with doing both jobs a lot of artists well tend to not write something he doesn't think he can actually draw. An artist on the Titans/X-Men miniseries would often have Cyborg get taken out of the battle immediately as Perez's design was a pain to draw. This isn't ideal as an artist should really push themselves and not always play safely to their strengths. He recalled an issue of Titans set in Raven's supernatural world. Rather than draw a simple bridge as asked, George decided to have it covered in the bodies of the lost souls in the realm. He drew hundreds of them. Later realising what a pain it was to draw, he ad-libbed and blew it up shortly after. He also gave the example of his first run on the Avengers back in the late seventies. Writer Steve Englehart decided to send the team back in time to the wild west in only Perez's second issue. The kick being, he had never drawn anything in that setting. He'd never even drawn a horse before! Of course, you don't say anything and draw the issue, learning as you go. "When an actor is asked if they can ride a horse, they say 'Yes!' and go and learn if they need to, because their job is on the line". The curse struck again in the second issue of his 90's Avengers run with Kurt Busiek. The team was send back to medieval times. Suddenly George is tasked with a whole new setting and redesigning dozens of heroes in that style. No comfort zones allowed indeed. To give an example of being able to adapt on the fly, George asked for a random scenario from the crowd. A young lady suggested a karate battle in a graveyard with the undead. Perez got to work, showing us the importance of setting the scene and choosing your angles and shots. 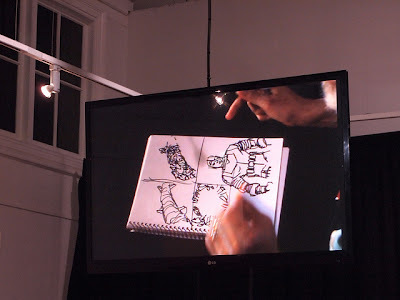 Even in this rough manner with a thick marker, it was fantastic to see him work his craft. Every panel was explained and justified and served a purpose. 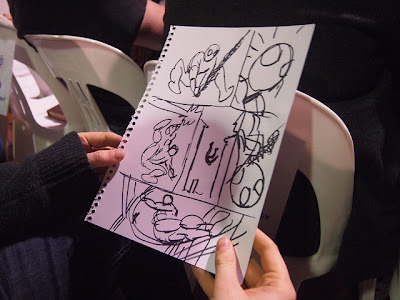 Apparently he had never drawn a zombie book before in all his years. We got the world premiere right here in Perth. The next audience question asked if there were difficulties in scenes with out action. 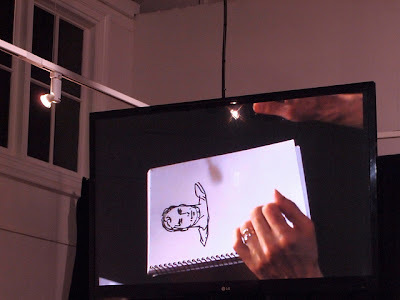 George explained that the "talking heads" type of scene is one of the hardest in comics. If that's the case he really shouldn't work with Brian Michael Bendis (but I digress!). A scene like this all about picking your camera (so to speak) angles and keeping it dynamic and interesting. 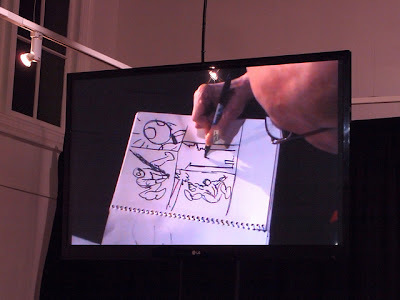 He sketched a rough scene of two characters talking at a table. Perez prides himself on attention to detail and stressed that often. There needs to be consistency fron shot to shot. Characters need to look the same, the setting can't change and the shots need to make sense. The next topic of discussion is the "George Perez style". What makes his Superman or Wonder Woman different from the others? He went on to explain that he doesn't really see his own style or unique little details that makes something specifically his. He just draws the characters as they are mean't to be. 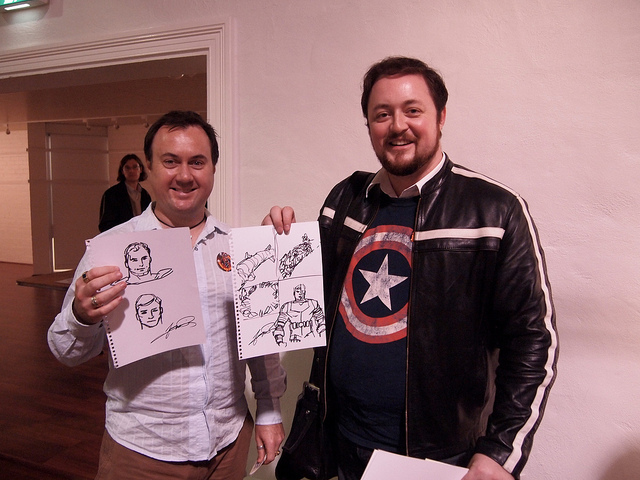 He drew a quick Superman bust explaining the little details. The hair, slightly bigger eyebrows with slightly smaller eyes, a cleft chin and if he smiles there's always dimples. Seeing it up on screen really sold it to me. I agree in every way. You should recognise these characters. They should always look like the same person regardless of who's drawing it. These aren't just costumes, they're people. He then scrawled a quick Bruce Wayne whilst lamenting how there doesn't seem to be a consistant look for him between artists. As he chatted he went on to sketch a quick Wonder Woman and a pretty great looking Hulk. It's amazing how effortlessly he can do something like this while carrying on talking to thirty people. I managed to get the host's attention and snagged the mic for a question of my own. I asked if there was difficulty in emoting and expressing a fully masked character like a Spider-Man or Iron Man. We were then treated to a sketch of a Spidey page with out hero being attacked whilst web swinging about. Perez explained the merits of letting body language and pantomime do the talking instead of words and facial expressions. A good storyteller can make it work like an old silent film of yore. He again stressed consistency and attention to detail. I'd have to agree. I often see artists change Spidey's eye pieces from panel to panel to evoke emotion. It doesn't make sense. A gentleman asked if there was a preference between working for Marvel and DC. Perez explained he doesn't love one company over the other. He is currently under exclusive contract to DC but this was motivated by DC having the better health insurance. Interesting. He went on to say he is happy he can pick and choose his projects. In fact this year he's only done one solitary Legion cover for DC. He can live comfortably on the royalties from his work decades ago and he is very proud of that. 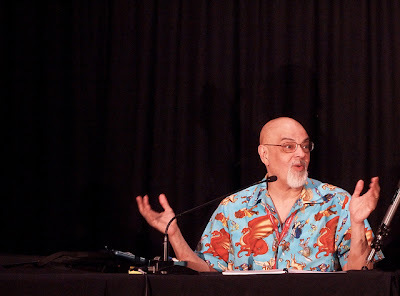 To wrap the panel George spoke of the Hero Initiative and the work it does for the pioneers of the industry, A lot of creators from the formative years of the industry receive no royalties for their work. The Initiative is a charity that steps in and helps out those struggling creators. George himself is chair of the panel that distributes the money. He hasn't turned down anyone yet. It's a worthwhile cause and you can check it out here. 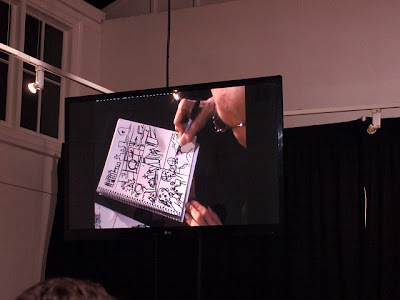 To my delight George gave his sketched pages from the seminar to those who asked the questions. I scored a nice rough Spidey page which George was happy to sign for me. 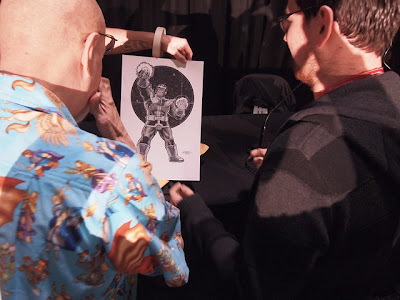 I mentioned in passing I was keen to pick up my Thanos commission I had organised some months earlier and he said I can grab it right now if I really wanted. My "squee" was audible as he pulled a damn gorgeous page from his bag. Worth every damn cent. In George's own words "I'm paid to be here, and you paid to be here". He is at our service this whole Supanova weekend. He'll be doing commission bust pieces and will literally sign as many books as you can lug up to his table. Which is good news as I have a tonne of his Avengers here waiting for his John Hancock. Be sure to go check him out in artist's alley. This larger than life comic legend is well worth your time. Credit to my lovely better half Katherine for her photos. You can find her on Flickr here.